If you’ve owned an older car, then you’re probably familiar with the increasing noises it makes as it ages. Just like humans, the creaks and groans get louder and more frequent! While there are some noises from your car that may well just be down to age and you can put up with, there are some that are dangerous to ignore. So let’s hear what your vehicle might be up to. Click. Snap. Pop. when you turn the steering wheel or Creak. Squeak. Thud. when you come to a stop. You could have a problem with your ball joints. Ball joints are the pivots that let your front wheels steer. 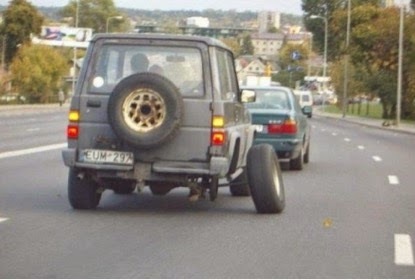 They support the weight of the car and keep the front wheels attached. 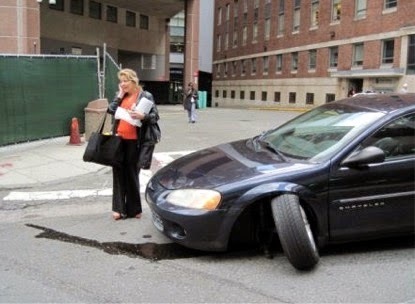 If they fail then your wheels may fall off, as seen in the picture below! Moan. Whine. Squeeeeal. from the steering column could come from your power steering system. Unhindered steering is vital for driving your vehicle safely, so it’s best to get the noise investigated as soon as possible. Often the noise is only heard when you turn the wheel as far as you can in one direction and this could mean that the power steering drive belt is loose or damaged. Other problems come from air in the fluid system or not enough steering fluid. Grind. Howl. from the wheels, especially on a corner, could mean that your wheel bearings or axle bearings are wearing out. Bearings fail when they run out of grease or get dirt stuck in them. The increased friction burns up the bearing, which could bring you to a sudden stop at any speed. Or if your rear wheel bearing completely fails you may lose your back wheel, with axle attached. Squeeeeeak. from brakes often tops the list of dangerous car problems. If you hear or feel anything unusual then you should have them checked, but some symptoms are more urgent than others. If your brakes start making loud metal-on-metal noises seek attention straight away. Ignoring them means you could destroy your brake rotors and brakes could fail completely. 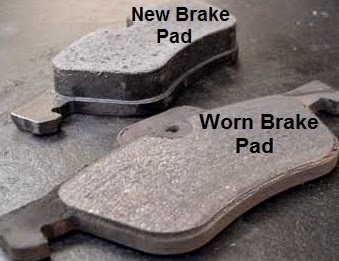 The picture below shows how the new brake pad should look versus the old. There are many more noises that could be described here, but our advice would be that any noise from your car isn’t ideal. So have it checked out as soon as you can. In the meantime let’s all dream about a silent, gliding car on a flat empty road. Aaaaaaaahhh!